Damian Finol is no stranger to international travel. When he was a baby, his parents brought him from Maracaibo, Venezuela to the U.S., so they could pursue graduate studies. 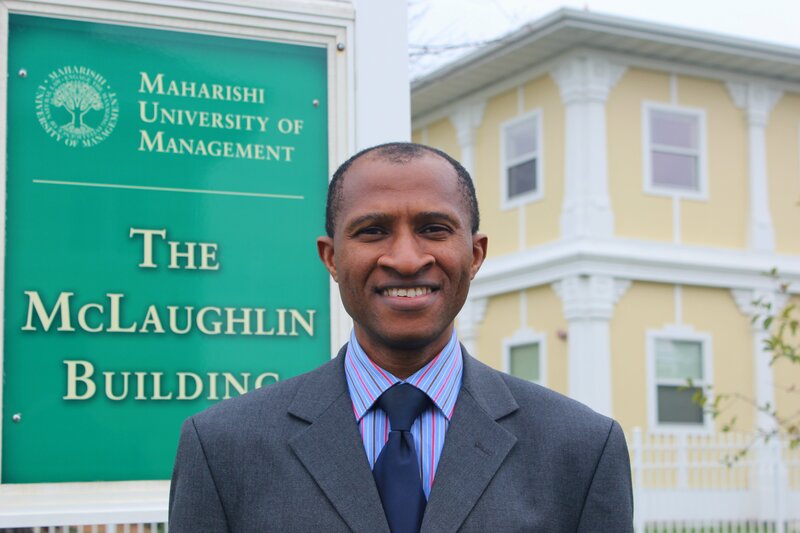 More than 25 years later, Damian has returned to the U.S. for his own graduate education in Computer Science at Maharishi University of Management. Damian’s love of traveling has led to work with the Wikimedia Foundation, where he helps establish Wikimedia chapters on every continent to bring “free knowledge” worldwide—a major accomplishment of which he is very proud. He is one of only 8-10 international Wikimedia Chapter Committee members with this distinction. 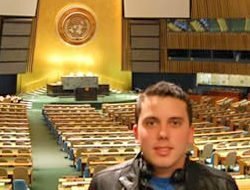 Damian Finol at the United Nations in New York. For example, in 2006, Damian gave a presentation at Wikimania at Harvard University on the usage of Wikipedia in Native South American tribes in northwestern Venezuela. Then, in 2008, in the historic Library in Alexandria, Egypt, Damian lectured on, “Social attitudes of Latin Americans toward Spanish Wikipedia.” This 25-minute lecture can be viewed at the movie archive of the Library. The Foundation continues to send him to different countries to establish chapters for preserving and disseminating free knowledge. Next month, he goes to Germany during spring break at MUM. 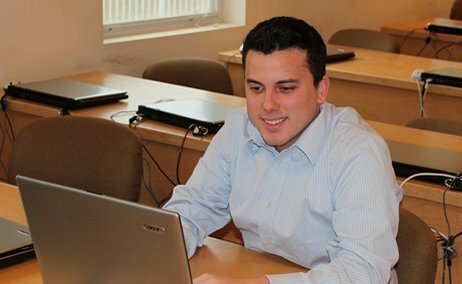 While studying to be an Informatics Engineer at Universidad Rafael Belloso Chacin in Maracaibo, Damian did mostly JSP/Servlets, and then switched to Unix/Linux system administration. This evolved to IT Security, where he worked for two of the biggest banks in Venezuela. He was responsible for managing the security of a big range of projects, including EMV chip technology on credit/debit cards and PCI-DSS Compliance (As required by VISA/MasterCard). From 2008-2011, Damian taught SQL/Databases, Project Management, Systems, IT Security and Linux as an Associate Professor of Computer Science at Nueva Esparta University in Caracas. After 5-6 years of Software Engineering, Damian decided to continue his academic preparation with a Masters degree. Several friends raved about their experiences at MUM, and after some research he decided that the curriculum (7-8 months of courses, studying one course per month full-time, followed by up to two years of paid authorized practical training in a U.S. company) was most inviting. He also liked the fact that the program fosters personal growth through the practice of the Transcendental Meditation® program. “People on campus and in the community are very friendly to the diverse student body. There are lots of activities in the Latino clubs, and a welcoming Catholic Church nearby. After only a couple days on campus, you can start calling the university your second home,” adds Damian. Damian thinks big, and everyone who meets him is impressed with his good nature, balanced personality, professional competence, self-confidence, and motivation for success. He would love to help create the next Google or Facebook, and is already making plans to start his own IT company. Upon completing his on-campus coursework in June, Damian plans to take an internship position near family in Seattle while enjoying a comfortable, safe and happy life. Watch a video about Damian and our MSCS program on YouTube.